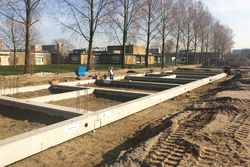 During the third stage of the Vlaardingen Holy project, 32 town houses will be realized. 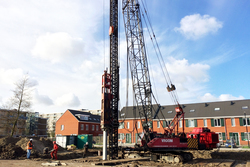 Dura Vermeer is responsible for the execution process. 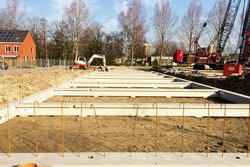 For BBS De Hoop, we will insert the foundation piles and the foundation beams. 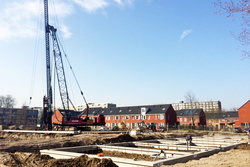 During stage 1 and 2, 19 rentals and 72 houses for sale have been realized. The first homes have already been taken into use. 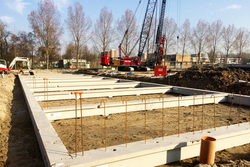 Once more, the foundation process in stage 3 involves prefab foundation piles and foundation beams. The elements will be produced in the factory, then processed on the building site as ready-to-go elements. The neighbourhood focuses especially on its green personality. 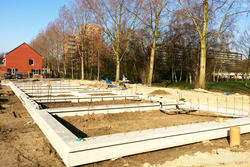 In addition to the renewed urban lay-out, also during the foundation process of the homes, more green is taken into consideration, for example an ivy alongside the public area in order to separate the parcels wherever possible. 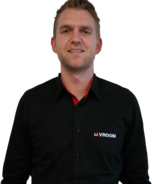 The city of Vlaardingen will uphold the statement that green breeding grounds for birds will be maintained. They emphasize the green, relaxing and natural personality. Contact Jasper Tump. Dial +31(0)299 409 586 or send us an e-mail.